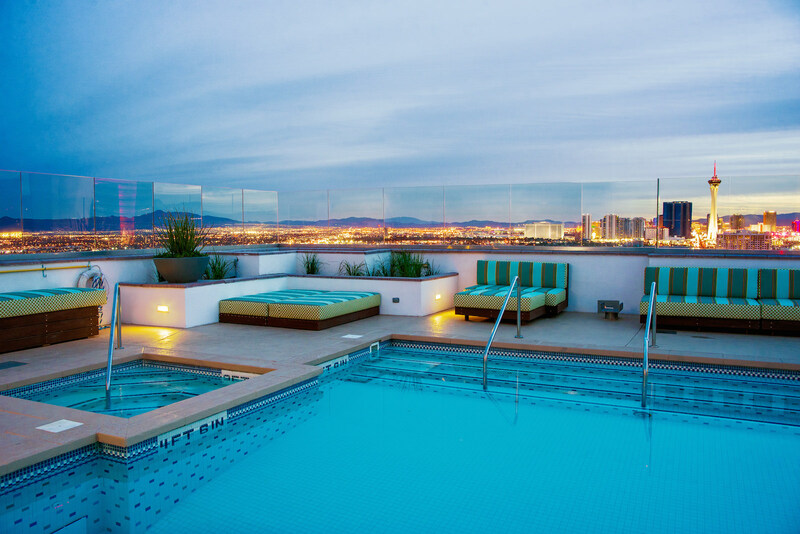 With the unveiling of its latest design enhancements and reimagined lifestyle amenities, The Ogden continues to lead the way for residential living in the heart of Downtown Las Vegas. 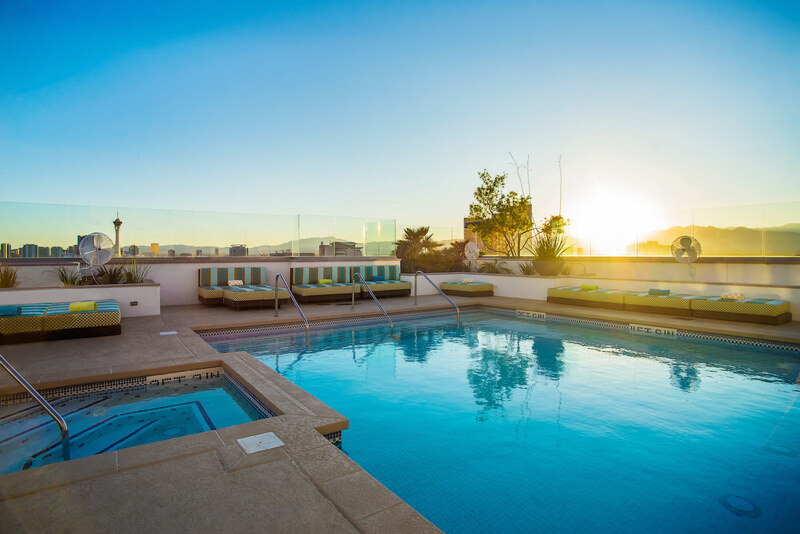 As part of a $2 million dollar re-design, which included its return to condominium residences, The Ogden introduces an enriched living experience, with a new lobby, Sky Deck, rooftop pool and 16th Floor Clubhouse. 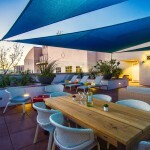 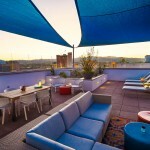 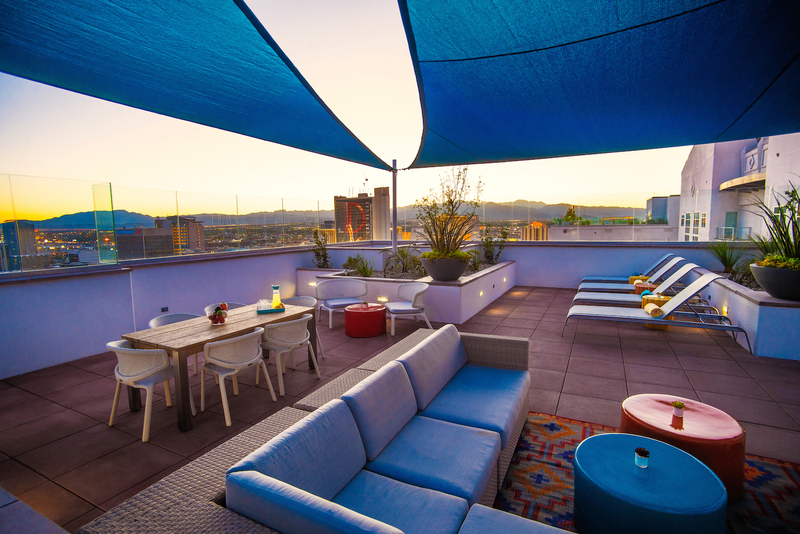 Its fresh new look and collection of vibrant artwork was devised to embody the stylishly, hip urban vibe of its bustling downtown neighborhood. 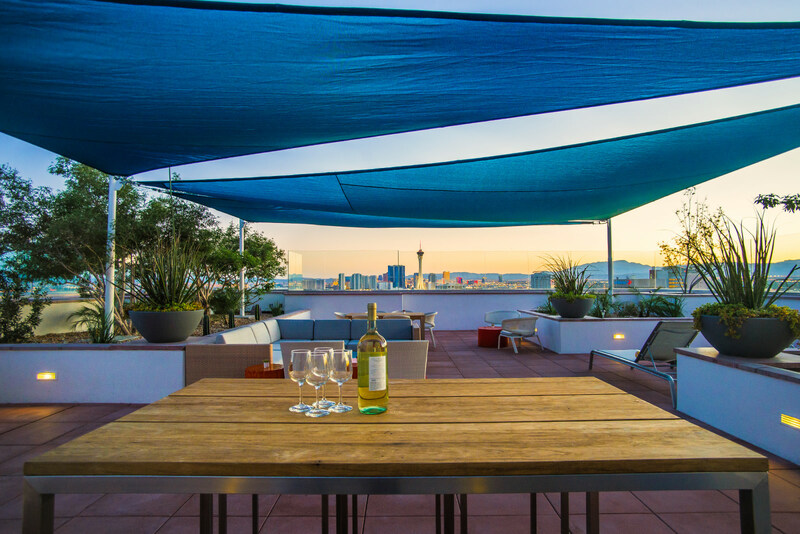 Interior Designer Lee Bryan was engaged to weave that downtown edge into the interiors and to create bright, comfortable living and entertaining spaces. 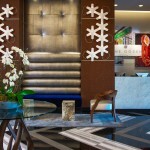 The new lobby features a contemporary mix of materials, textures and finishes. 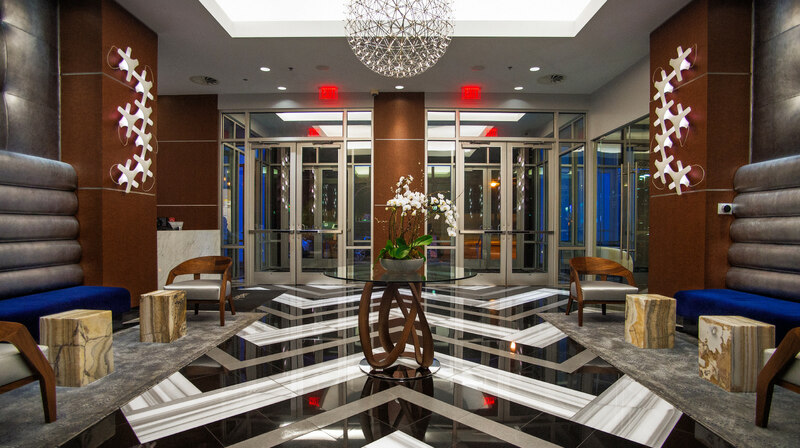 The floor is a bold zigzag pattern of marble, porcelain and granite, while the walls are adorned with glass-beaded wall coverings. 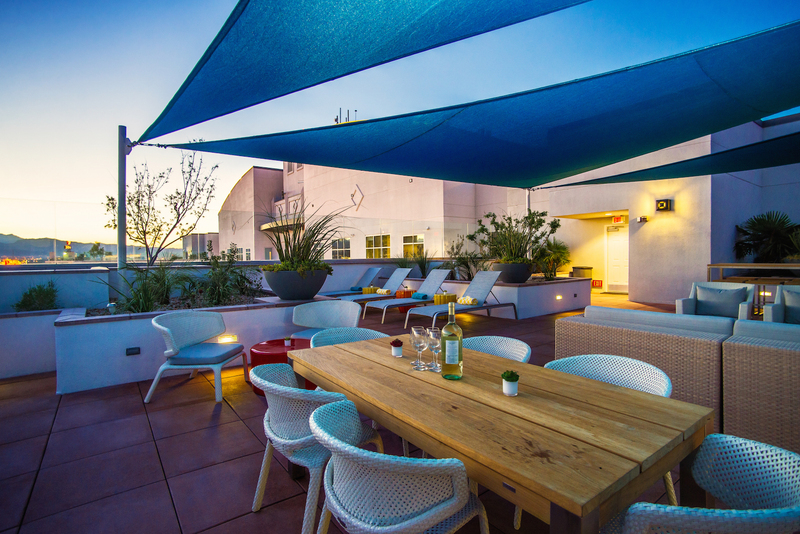 Over-sized banquettes feature embossed silver leather that ascends to the ceiling, with navy blue mohair-covered seating and onyx stone tables, creating conversational seating areas or casual work spaces for residents, with wi-fi now available throughout the entire building. 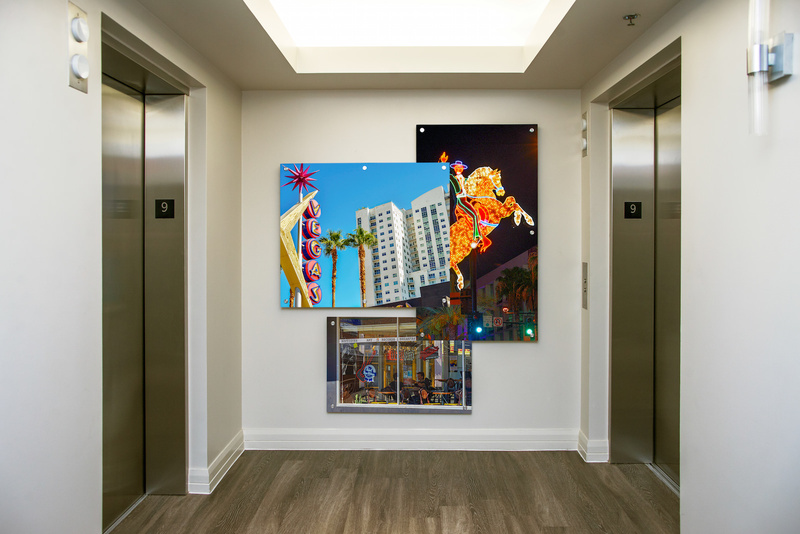 The center of the room is illuminated by an LED globe chandelier, lighting the way to the newly renovated elevator lobby. 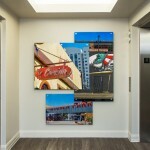 Local photographer Bryan Hainer was hired to capture Vegas’ iconic landmarks, burgeoning downtown art scene and popular locales. 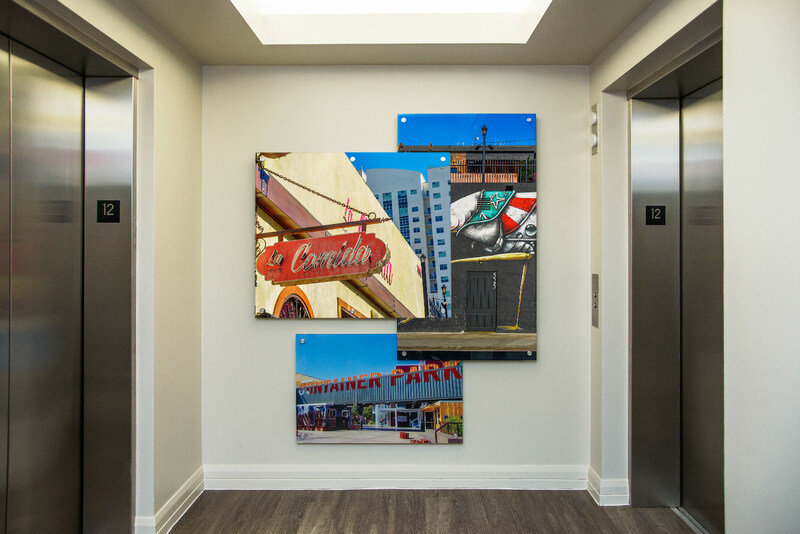 “We then created these glass-layered collage art installations showcasing classic locations and new downtown hotspots to really infuse the heart and soul of the city into The Ogden,” says Vaknin. 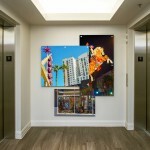 The installations adorn the newly upgraded elevator entrances on each floor. 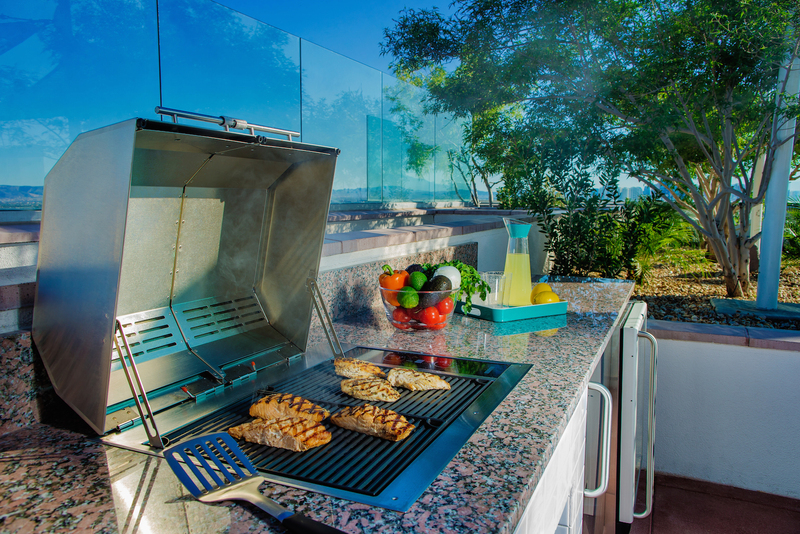 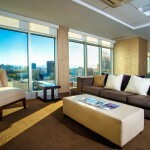 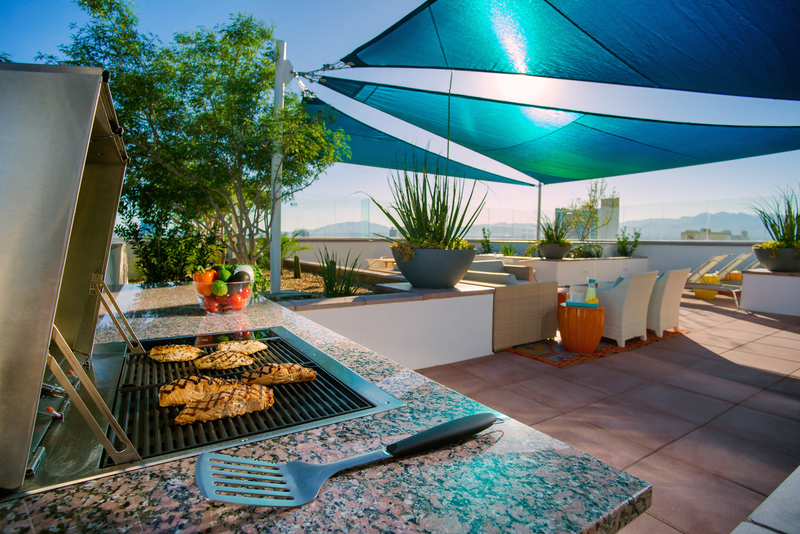 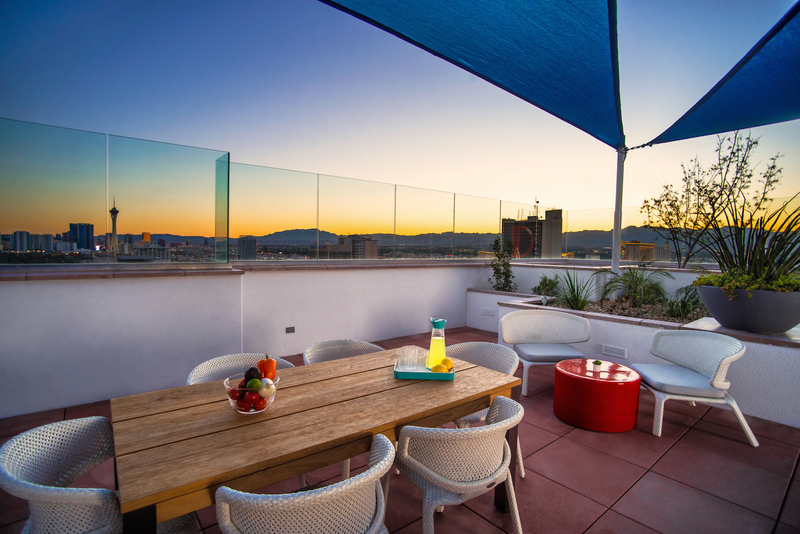 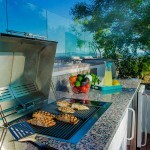 The Ogden’s amenities were also revamped to create gathering and entertaining spaces that homeowners could enjoy year-round, beginning with the Sky Deck on the 25th floor. 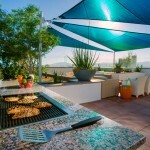 Canvas shade structures were installed, as well as a summer kitchen with grill, fridge and wine cooler. 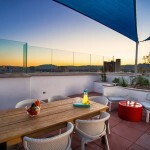 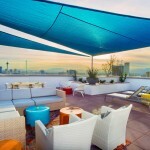 A diverse grouping of seating arrangements were situated so residents could dine al fresco, meet for cocktails at high-top tables or lounge in the cozy outdoor living room, surrounded by the enhanced lush, desert landscaping. 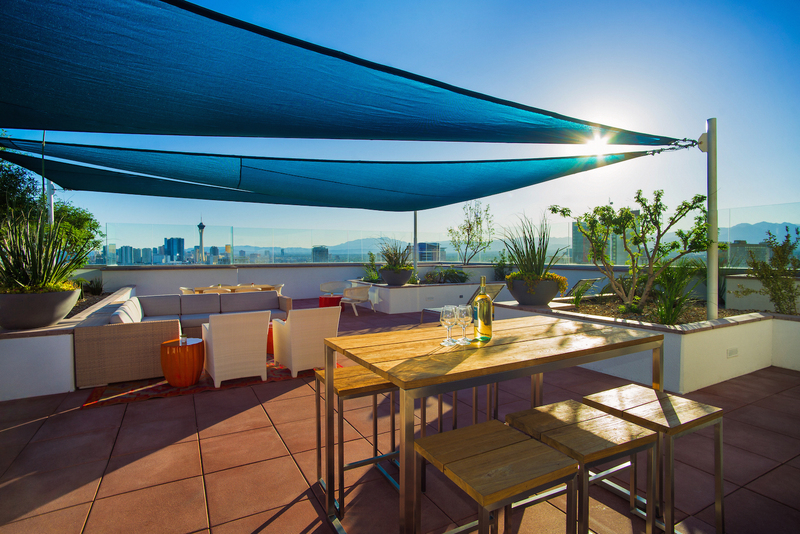 “The Sky Deck is now the beloved amenity at The Ogden; it’s a wonderfully programmed, usable space,” says Vaknin. 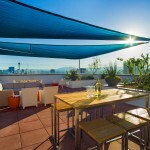 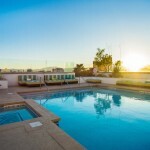 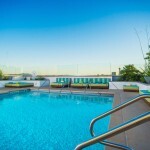 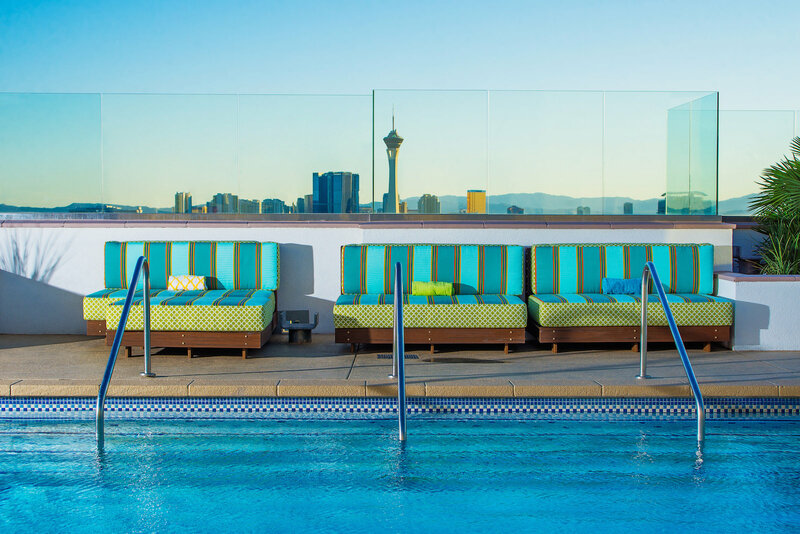 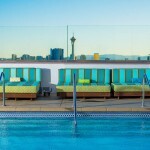 The Ogden’s rooftop pool now feels more like the pool of a classic, upscale Vegas hotel, with new modern furnishings and misters that continually cool the area. 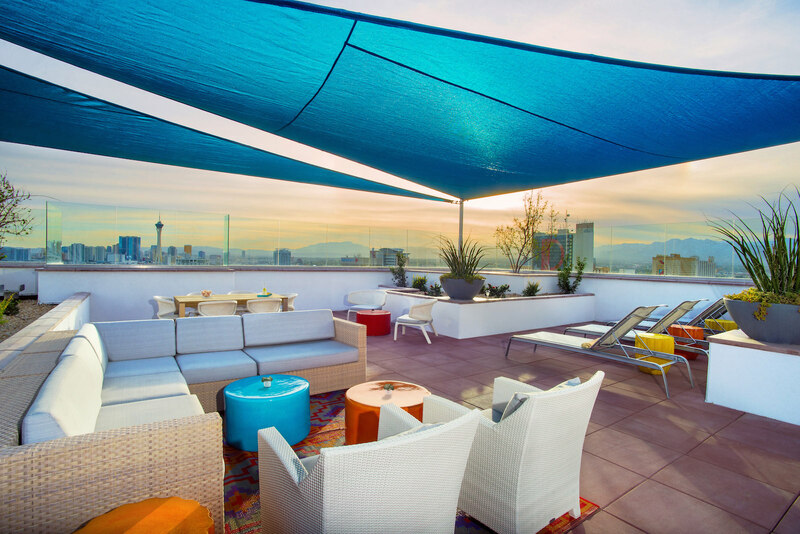 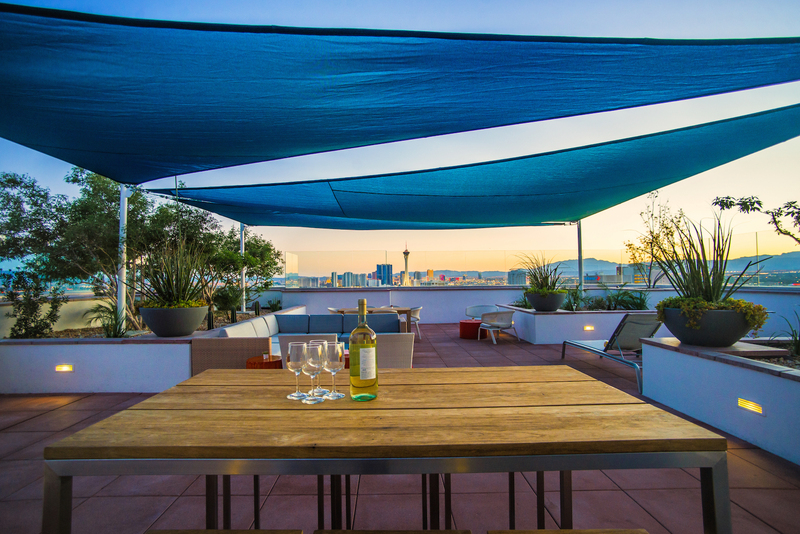 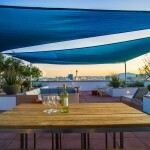 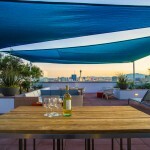 Both here and on the Sky Deck, new furniture features pops of color – blues, greens, oranges and yellows – with fabric that reflects the sun and doesn’t absorb the heat. 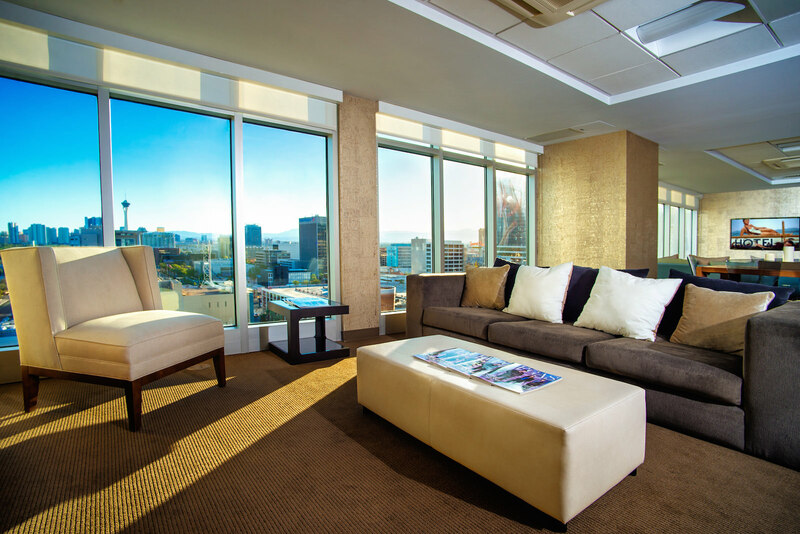 The new 16th Floor Clubhouse provides homeowners with a spacious indoor entertaining and meeting space, the ideal place to host a party or a conference, catch a movie or work remotely. 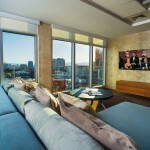 The room features an open concept design with kitchen, dining or conference table, two comfortable seating areas and two TVs. 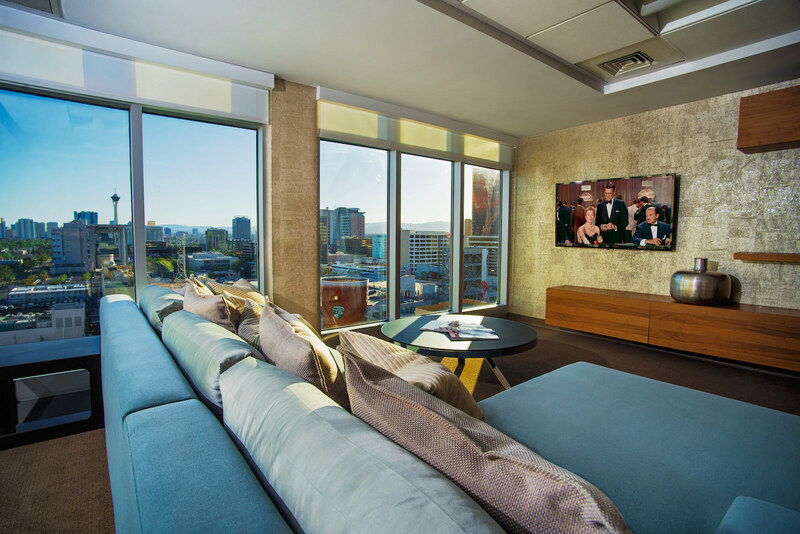 It’s elegantly decorated with gold-leaf, textured wall-coverings and plush new contemporary furnishings, while floor-to-ceiling window walls draw in abundant light. 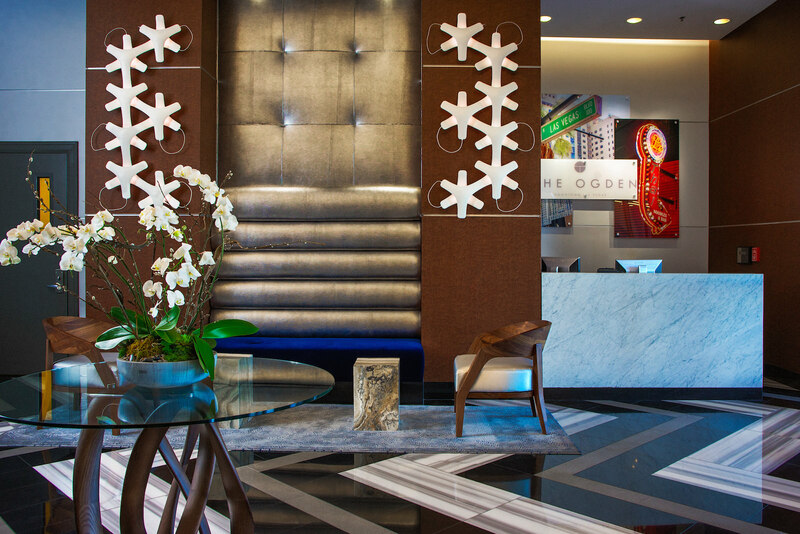 In addition to its lifestyle amenities, which also include a pet park and ground-floor dining, The Ogden also features an array of exceptional services including onsite management, concierge service, 24/7 security and dry cleaning valet. 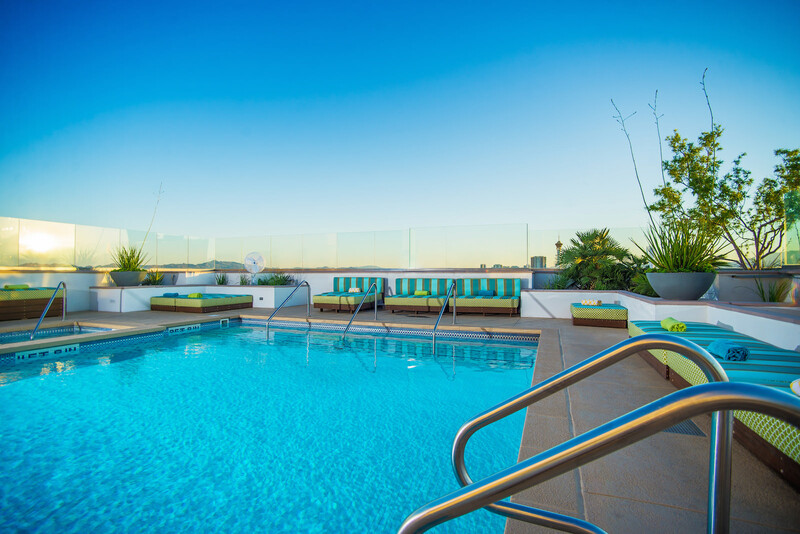 The Ogden offers one-, two- and three-bedroom residences, priced from the $200,000s to the mid $600,000s, thoughtfully refreshed with modern design highlights and refined finishes. 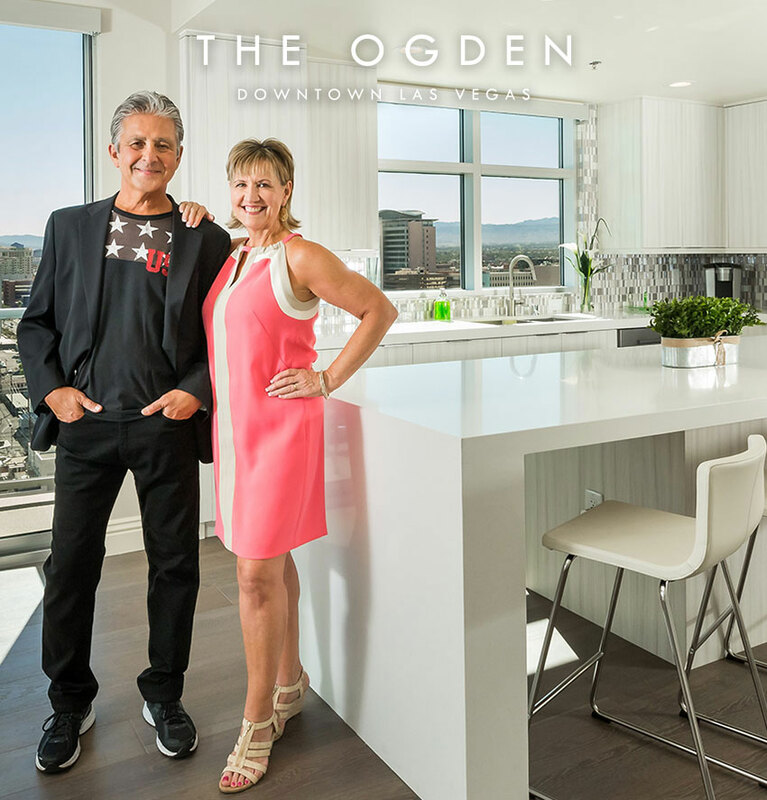 Read more about the $2 million enhancements and The Ogden’s transition back to condominium residences in the Las Vegas Review Journal here. 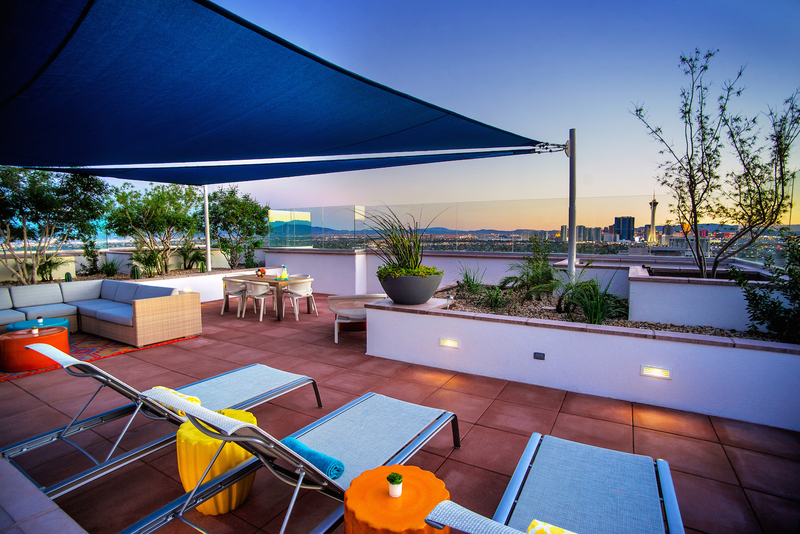 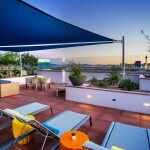 To learn more about The Ogden’s limited-time 2% buyer incentive and low down payment program contact (702) 478-4700.